Version 2019 must be activated in order to use it as there is no longer a Trial Edition. Even the Free version requires a product key code. If you did not retrieve a free license code, please visit https://portal.seagullscientific.com/Downloads and sign into your account. At the top, you will see an option to get a free license code. For troubleshooting, please see our Activation Denied Troubleshooter. The most straightforward method for activating your software is to activate during the installation process as the activation wizard will immediately open after the installation is complete. There are two methods to do this depending on your setup. If this is the first time you're installing BarTender, you'll want to enter a new product key code. If you're installing a client computer and have a license host already setup, activation is much simpler in 2019 than in previous versions as you can pull the product key code from the host to the client. This activation wizard guide will walk you through both methods of activation. 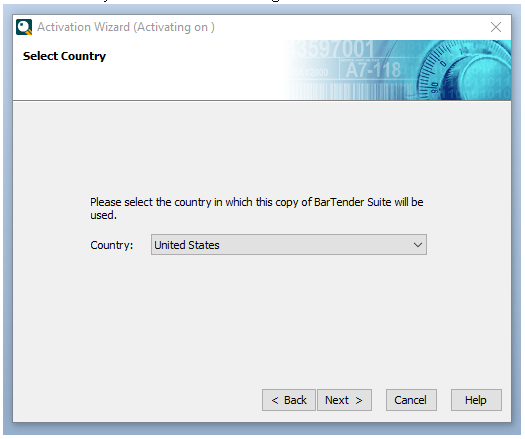 Note: If you choose to not enter a product key code, BarTender will launch the activation wizard whenever you open one of the suite applications. You cannot use the software without activating a license. 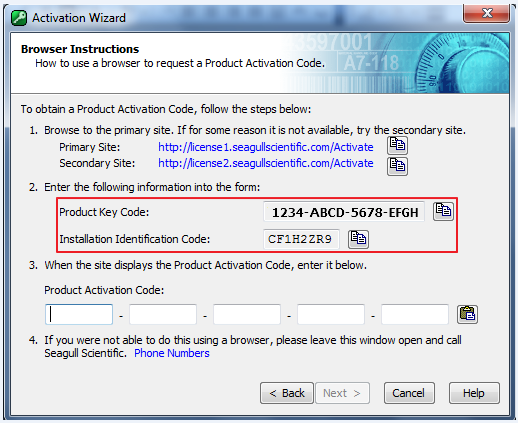 If you find that the activation wizard does not launch when opening the Administration Console, drop down to the next section labeled "I'm activating a new product key code"
If you are activating your product key code during installation, please see the First time activation section above. Activation and license management has moved to the administration console in version 2019. Here you can add an additional license to your network or activate a new license (for first-time activation or changing your product key code). Click on "Activate a new License"
While you can only have one active license host per product key code at a time, you have the option to provisionally license a second license host for a limited time. This is useful for test or QA environments where you don't want an environment to contact your main license host. If you are activating during install, the activation wizard will pop up immediately. Click "Add a new License"
Enter the same product key code that is already active on a different license host and click next. The wizard will detect the other License Host active and ask if you wish to activate provisionally. Check the checkbox then click next to activate the license host provisionally. If the wizard populates with a list of License Hosts, choose to enter a new product key code. Enter your product key code into the boxes and click Next. On the next screen, specify where you'd like to host your license. If you'd like to host it in another install, you can choose the name from the list (if it's broadcasting) or type in the host's name. The wizard will automatically populate the list of licenses broadcast on your network as well as information about the license host. Select the license host from the list and click next. The wizard will inform you that you'll need a stable internet connection for this process. If you do not have one, please refer to the phone and browser activation options listed here. Once activation is complete, you'll receive a confirmation. Next you can choose if you'd like the license to be available for other computers on your network. Once you're done selecting your option, click Next. Register your software then click Finish to close the wizard. Activating the BarTender Suite is a quick and simple process if you have an Internet connection available. If you don't have an Internet connection, you can activate from another computer instead. I'm activating during installationI'm activating post installationI don't have an Internet connection!I'm getting an error! Toward the end of the installation process you will be prompted to activate the software. Click Activate Now to open the Enter Product Key Code window. Enter the Product Key Code provided in the software package or confirmation email you received. 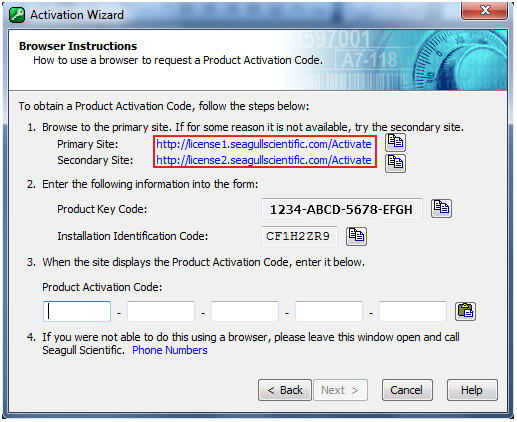 Click Next to open the Activation Policy window. Select (check) I Agree to accept the Activation Policy. Click Next to open the Select Country window. From the dropdown list, select the desired country and click Next. You will see a notice about an active Internet connection. Click Next. The Activation Wizard Completed window opens. Note: If you do not have a working Internet connection, but you do have another PC available with an active Internet connection, refer to the Try Browser Instead section of this article, below. If you do not have any Internet connection available please contact Technical Support. You have successfully activated the BarTender Suite. 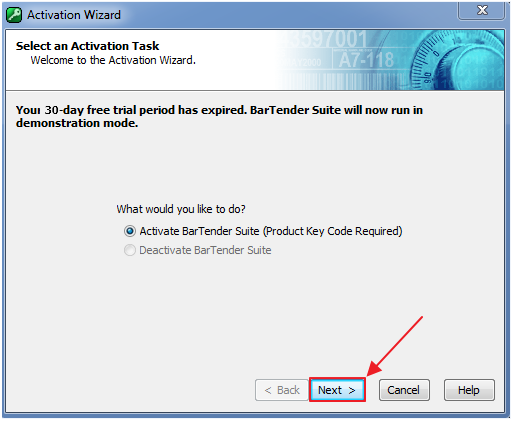 You can also activate the BarTender Suite after your installation has completed, or if you have previously installed a BarTender Trial edition. 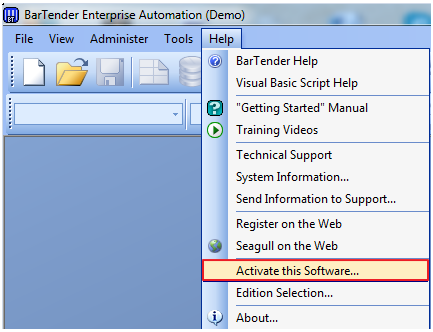 From the BarTender Help menu, select Activate This Software. 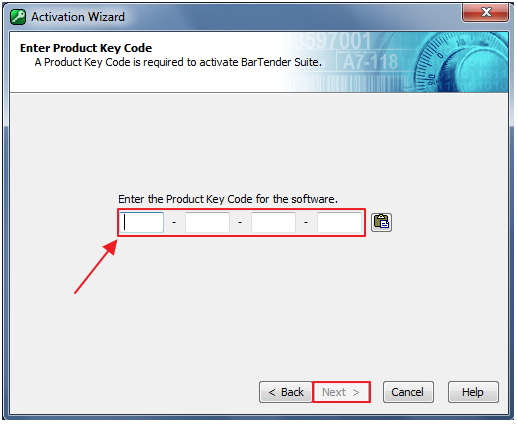 Leave Activate BarTender Suite selected and click Next to open the Enter Product Key Code window. 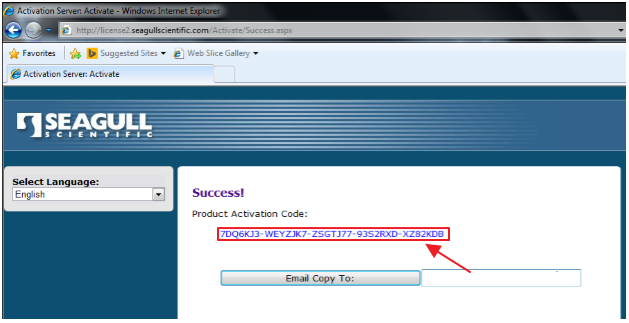 Enter the Product Key Code provided in the software packaging or confirmation email you received. From the dropdown list, select the country that you're activating in and click Next. Note: If you do not have a working Internet connection, but you do have another PC available with an active Internet connection, refer to the Try Browser Instead section of this document, below. If you do not have any Internet connection available please contact Technical Support. 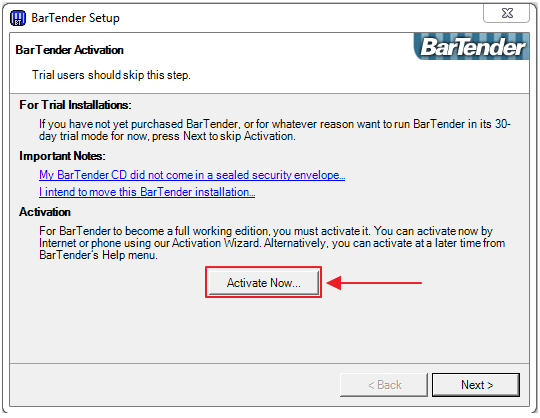 If BarTender activation fails because your PC has no active Internet connection, you can still activate BarTender using another PC's active Internet connection. From the Internet Connection window, click Try Browser Instead. The Browser Instructions window opens, displaying several important pieces of information. If you do not have another internet-connected computer available, select "Phone Numbers" at the bottom of the screen. Leave the dialog open and a technical support agent will assist in generating a Product Activation Code for you. Write down the Primary Site for activation. Also write down the Product Key Code and Installation Identification Code. Leave this window open and move to the other PC with an active Internet connection. Open an Internet browser and enter the web address for the Primary Site to open the Activate Software web page. Enter the Product Key Code and the Installation Identification Code. 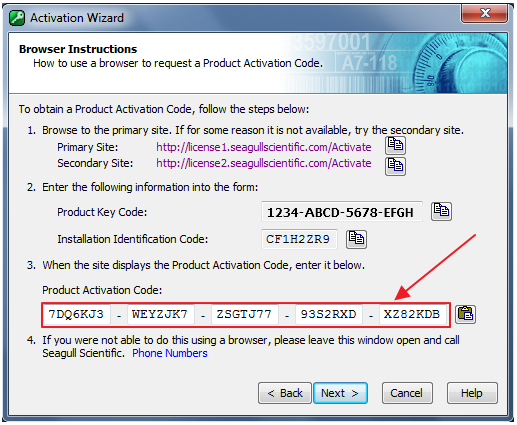 Click the Generate Activation Code button to open the Product Activation Code web page. Write down the Product Activation Code. Close your Internet browser and move back to the other PC where BarTender is currently installed. 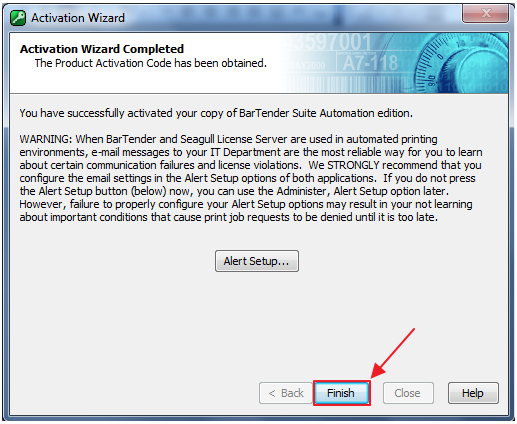 Enter the Product Activation Code in the Browser Instructions window on the BarTender computer. 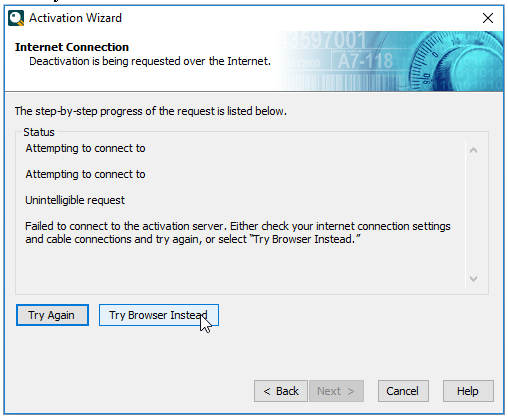 Click Next to open the Activation Wizard Completed dialog. When the License server is on another subnet you cannot fullfill the activation, then you have to choose "Continue". Afterwards you can manually configure the license server in BarTender Suite when you look at the option "Manage - License Setup". Disable "Automatically find Seagull License Server" and enter the License Server's IP address in the field "Preference"
Check the portnumber and so on. maybe you can take this scenario together with the scenario above. What you are describing is covered in the article "BarTender cannot locate Seagull License Server." 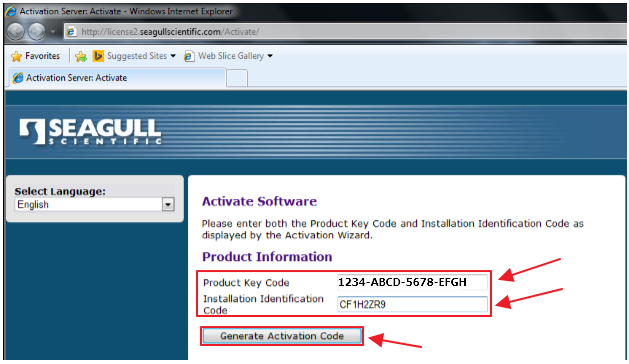 This article covers activating the software with the product key code. You are referring to connecting to Seagull License Server after you have activated the BarTender client. Activation denied. Your allocated number of activations has been exhausted. Activation will now only be allowed on the computer where you last successfully activated this software.